We have an immediate opening for an experienced auto glass tinter. Part time or full-time. 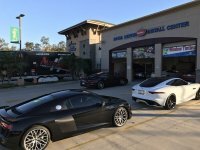 25 year established business in affluent community of Rancho Santa Margarita, California. Please send resume to phil@ataudio.com or call us at 949-888-6581 and ask for Billy. If you have additional skills please inform us as we are also a custom stereo shop, paint protection, vinyl wrap installation.